New from Deb & Co.'s "Giggle Gang Collection" , this darling little girl is all dressed up for the Christmas Party! Of Course she has her gifts at hand. As with all of Deb's ornaments it is wonderfully detailed right down to the curls on her head. 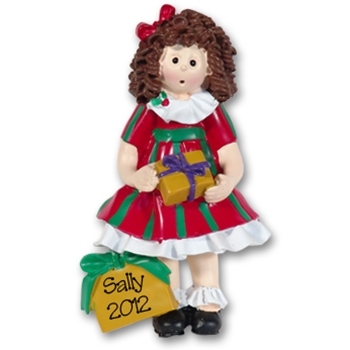 It may be easily personalized with a name and year on the gift at her feet. . Designed by Debi Allison, it is made from resin and hand painted. Comes complete with satin ribbon and hook for hanging.